Thank you everyone for your comments on Postcrossing’s anniversary post — your kindness and thoughtful words were the highlight of our day! 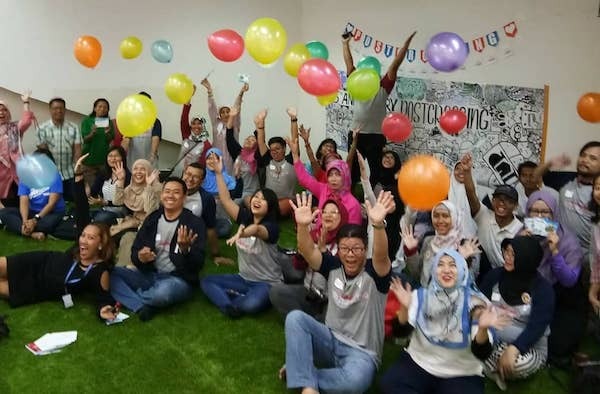 Quite a few meetups took place all around the world on Postcrossing’s birthday last weekend, and we were so emotional watching all the videos and photos, we decided to share some with you. In Tofte and Filtvet (two small coastal towns along the Oslo fjord in Norway), a large meetup took place that included participants from all over Europe. Together, they’ve wished Postcrossing a good anniversary by singing the “Happy Birthday” song in their own languages… what a nice idea! We cannot stop smiling when we watch this video. I hadn’t even realized that the song had a different tune in some languages, and was delighted to discover that it sounds just as festive in Greek or Norwegian! In Portugal, a birthday meetup in July has already become a tradition. 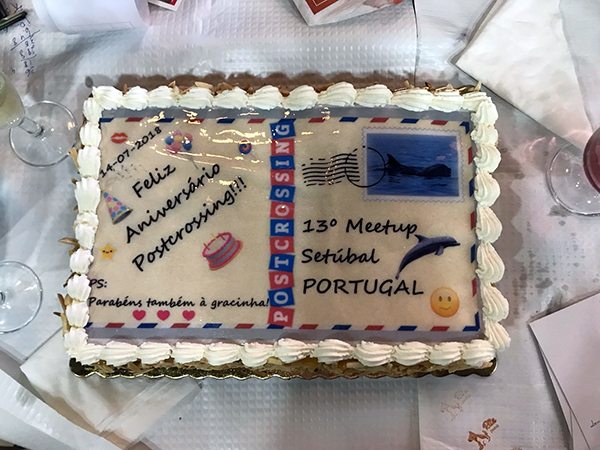 This year’s meeting took place in Setúbal (a town famous for its dolphins) and it featured a cute birthday cake. Gracinha, one of the participants, had just celebrated her own birthday last week, so the participants also included her name on the cake, and sneakily prepared a big card and gifts to offer her during the meetup. She loved the surprise! 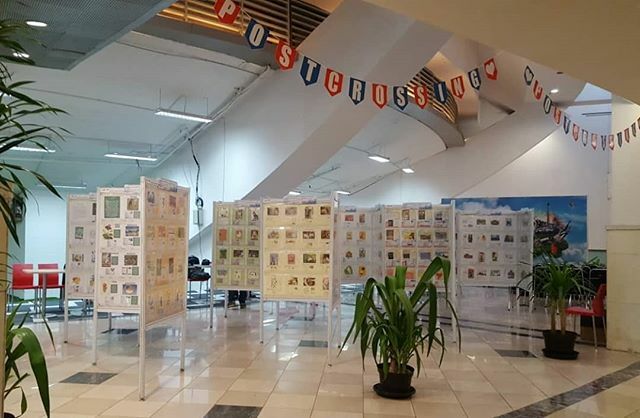 Across the world in Indonesia, the Postcrossing community came together to organize a postcard exhibition and meeting at the Plaza Semanggi mall in Jakarta. Looks like a good time was had by everyone at the event which stretched for several days and included live music and even a doodling workshop! You can see tons of more photos on their Instagram page. Hurray! People coming together and making new friends could not be more in the spirit of this project, so we’re delighted to see so many happy faces on these photos and videos.  If you’d like to participate in one in the future, don’t forget to check the Postcrossing meetups calendar now and then, to keep updated on new events taking place in your area. Hurray, happy postcrossing anniversary! love being a part of postcrossing family..excited to see Indonesia here..
Gorgeous to see people around the world with similar joy. At the end, we really share same experience, no matter apparent differences! Thanks Postcrossing to letting us aware of it. Congratulation to all you P O S T C R O S S E R around the world ,what a great community I love you all. Keep on going the meet ups are fantastic.Compliments to Indonesia great pictures. Congratulations! I am proud to ble part in the first song. The meeting in Norway was lovely!!! The postcard cake looks so good! Fantastic! !...I feel very proud to be a part of such a great group of people. Congratulations to the celebrants for doing it up right...Happy Postcrossing to you all!! Happy Birthday Postcrossing, Always fun! Seeing the world on little bits of cardboard. Happy Postcrossing anniversary! I was so happy to be a part of the meeting-group in Norway. We had lots of fun singing the birthday song in different languages. HIEP HIEP HOERA! HAPPY BIRTHDAY TO EVERYONE. H A P P Y P O S T C R O S S I N G!!! How wonderful! It is a pity that my parcel with gifts for the birthday of postcrossing was delayed at the customs in Portugal. I hope it will be delivered after all. Good luck!!!! Happy birthday! Postcrossing has blessed so many people and brought us all joy. Happy Anniversary! That cake is brilliant!! Thank you for all you do! Congrats! You make a better world. Fabulous 😀 We had a wonderful and truly international 🌎🌏🌍 meeting in Dublin last Saturday - Ireland, Britain, Germany, Spain, Portugal, Mauritius, Kazakhstan and Brazil 🙆 - various ages and stages in life but all bound together by our passion 💖 for postcards and communication 📝. Long may this wonderful site continue helping to break down all sorts of barriers and concentrating on our similarities rather than our differences. Massive well done 👏 and congratulations to all who help make Postcrossing such a wonderful experience 💐. Once more, happy Postcrossing-versary, feliz aniversário, buon compleanno, and gratulerer! The Norwegian meetup was amazingly fun and surprising! I will publish my report about it today in the meeting forum thread and on Facebook. Joyeux anniversaire...Et encore merci pour cette idée géniale. Saviez-vous que la poste suisse a édité une série de timbres "postcrossing" ? Χρόνια Πολλά Postcrossing. You bring smiles to people all over the world. The meetup in Norway was great and the singing in various languages very fun.... Hugs to the lot of you... crazy wonderful postcrossing community . janam din ke shubkamnaein (birthday wishes in hindi) postcrossing ! any special cards or stamps to look out for? It's so nice! Happy Birthday Postcrossing! You have a great place in my life! It's so nice to see all the people around the world celebrating our passion in Meetings and with wonderful ideas to give a tribute to this awesome project. i am very much instersting and also connecting the people. I'd love to go to something like this. Happy birthday! just come back to this site after 10 years of absent.. still feeling the delightful of exchange postcards.. get ready to postcrossing again in the next several days.. This is absolutely fabulous! All the best for you all! What a great community we are! Thank you for sharing the fantastic birthday celebrations of Postcrossing around the world!